The St. Louis Blues are officially headed to the postseason. 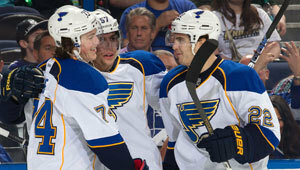 With Saturday’s 3-1 win at Tampa Bay, the Blues became the first team in the NHL to clinch a playoff spot. They currently sit No. 1 in the League with a 46-19-8 record and 100 points, enough to guarantee they’ll finish the season among the Top 8 in the Western Conference. "It's the first step. We're proud of that. We're organizationally proud of that," said Head Coach Ken Hitchcock. "It's the first step of what we want to do. It's been two or three months of really good hockey." Becoming the first team to clinch a playoff spot is a big accomplishment for the Blues, a team that started the season with a 6-7-0 record. Since hiring Hitchcock on Nov. 6, the Blues are 40-12-8. After decades of consistency (the Blues reached the playoffs 25 consecutive seasons from 1979-2004), this will be just the Blues’ second playoff appearance in the last seven seasons. With nine games remaining, the Blues could still set a franchise record for most points in one season. The current record was set during the 1999-2000 season when the club captured the President’s Trophy with 114 points (51-19-11-1). Single Game Playoff tickets for Round 1 (Home Games 1 and 2) will go on sale to the general public on April 4. Sign up using the form below to be contacted with more information about Playoff Tickets when it becomes available.